After you find all the dinosaur bones you will proceed to the next section of the game. 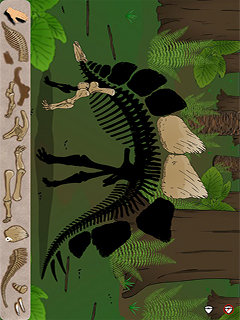 In this section drag the bones to its corresponding location to complete the dinosaur skeleton. Finally after you completed the skeleton, the dinosaur will come back to life! Touch its head, back or tail to get different reactions from the dinosaur. Also you will unlock a new dinosaur. Angry Gran Run - Runn..